The Mayor is launching a design competition for the Providence River Pedestrian Bridge on Friday afternoon. 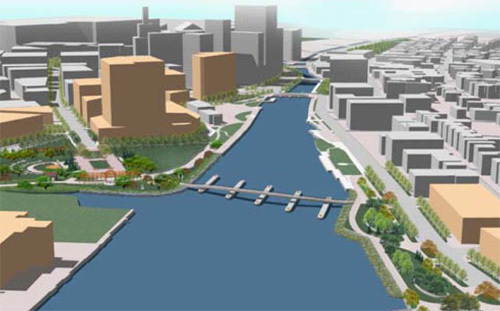 The RFP RFQ will reportedly be up on the Planning Department’s website by Friday. I will be at the press conference on Friday and will be reporting back the salient details. In the meantime, check out this thread from January when we last discussed this bridge proposal. I don’t get it. Didn’t we already talk about this? And there’s another competition? I’m confused. They did a design competition for the parks, but the bridge was not part of that competition (mostly because it was not funded at that point). There has been a small group working on the bridge for some time, which is where the drawings in the referenced post above came from, but word coming out of that group was that no one was happy. Hopefully this competition will result in a worthy design and not design by committee, which was the direction it was going in. BTW, what ever happened with the winners of the park competition? They’ve put out the RFQ today instead of an RFP. Oops, I knew it was going to be an RFQ and just typed RFP out of habit of everything being and RFP. CHanged above. I took video of the press conference and will have it posted later this afternoon.